An eastern Iowa icon is getting back in the game. 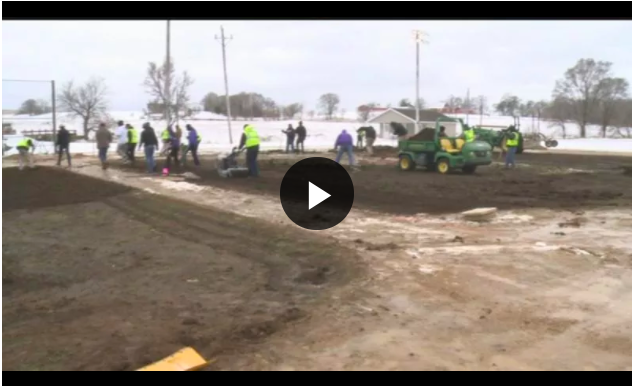 More than 50 volunteers braved the unseasonably cold temperatures to repair the Field of Dreams. “So what we’re doing in the background, we’re removing the damaged sod, we’re regrading the field to fix the ruts where it got tore up,” said Steve Bush, owner of Bush Sports Turf. The iconic field in Dyersville was damaged in January after someone drove on it, causing deep tire tracks on the grounds. Baseball fans across the country responded showing love and support with donations to help rebuild the field. Crews from area Minor League Baseball teams also helped, including the Cedar Rapids Kernels, Iowa Cubs, Quad Cities River Bandits and Clinton LumberKings. With their efforts, the field now has a new pitcher’s mound and home plate area. “The thought came to mind, let’s call the minor league teams in Iowa and see if we can pick a day where everybody brings their grounds crew and a couple staff members in, and try and fix it for them cause they really don’t have a budget for that here,” said Jeff Lantz, senior director of communications for Minor League Baseball. For added security, a surveillance camera system has been added. The Field of Dreams has yet to find out the total cost of the damage, but it’s possibly in the thousands. they’ll be able to get a better idea once they check the underground sprinkler system.